You are here: Home / Culture / London Alert: The Iconic Lights in Piccadilly Circus Have Been Turned Back On! London Alert: The Iconic Lights in Piccadilly Circus Have Been Turned Back On! We reported earlier this year that the iconic billboards in Piccadilly Circus were being switched off for refurbishment. Many Londonphiles were very disappointed to hear this as it meant that tons of tourist photos would be ruined by scaffolding and hoardings. This was the longest stretch of time the lights were turned off since The War. Well, fear not! The renovations are done, and the lights have been switched back on! While the traditional shape has been maintained, the new sign is one massive curved screen that replaces the original six billboards. Now, the screen can be used for unified advertising. One thing is clear; this new screen is BRIGHT. The screen, which is controlled remotely, has an interactive capability, offering live video streaming, weather updates, sports results, and social media feeds. I expect the new sign to become a centerpiece in London that people gather around for major events. Want to have a look for yourself? Then stroll on down though I suspect that crowds will be thick now that the lights are back on. 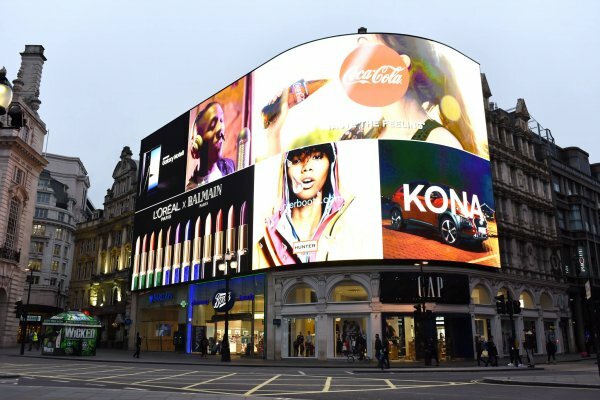 Landsec, the owner of Piccadilly Lights, has replaced the original patchwork of screens with a single state-of-the-art 4K LED digital screen and live technology hub, which allows the screen to react to certain external factors, such as the weather or temperature. This feature enables brands to display creative and innovative content, such as weather-appropriate clothing. The technology does not collect or store any personal data and is unable to record images or audio. Coca-Cola, Samsung, Hyundai, L’Oréal Paris, eBay, Hunter and Stella McCartney are now advertising on the newly-launched screen, which is managed by Ocean Outdoor. This advertising hoarding could be anywhere. I say bring back the Guinness clock, with the toucan pendulum, I used to see on my way to and from work during the 1960s – that were of both use and ornament.